Just over a year ago, I mentioned I was working on an RPG. As a reminder, here's my original design intent, and a follow-up piece about a turn sequence for combat. I thought I was writing an RPG. What I was really doing was accumulating ideas into a bunch of separate documents that were masquerading as chapters, but were really more like a series of themed notebooks. Like some kind of hoarder, I had been accumulating for years, and when it came time to try to put them together, I realized how much I'd been fooling myself. Each document was layers of incompatible mechanical ideas, stacked ten deep like geological strata. Aaugh! Bashing that into something playable was much more work than I was expecting. Anyways, I'm pleased to say there's now a playable core, thanks to starting a play test campaign. 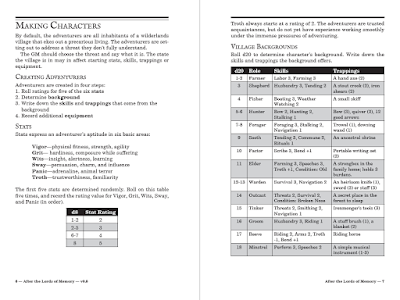 Nothing forces you to make mechanical decisions like creating a character sheet to hand to your unsuspecting victims. I'm now a year into that campaign. Some of the ideas that originally motivated me to start this project in the first place are still waiting to come onto center stage, but the basic structure seems to be solid. It's getting easier and easier to incorporate each new piece without having to use duct tape, with so many other places in firm shape. The next hurdle is slowly transforming this into something that other people can use. I haven't quite decided what process I want to use to do that, but my goal is to start getting bits of it out so that people can tell me what they think. 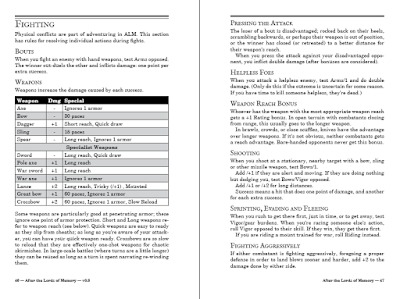 To that end, here's a few pages on getting hurt, how the turn sequence works, a few fighting mechanics, and some commentary on what I want fights to feel like. EDIT: ..and since that's confusing on its own, here's some of the earlier parts.